An undulating, space-age lobby ceiling sculpted by Isamu Noguchi in the 1940s has been uncovered at a U-Haul store in St. Louis, where it has been hidden by partitions and a drop ceiling for over two decades. An exhibit on the city’s modernist design at the St. Louis Art Museum and subsequent radio segment alerted the public to the hidden modernist masterpiece. After St. Louis citizens created a Facebook group to call for restoring the ceiling, U-Haul assented and started the restoration process last November. After more than six months of restoration, the U-Haul store has uncovered about 80% of the ceiling. Noguchi designed the ceiling, known as a lunar landscape, for architect Harris Armstrong, who is considered to be one of the most prominent modernists leading the movement in St. Louis during the ’40s and ’50s. 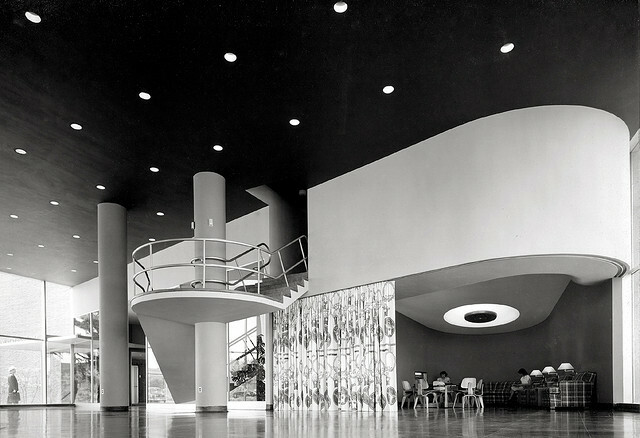 In 1946, Armstrong built the “Magic Chef” building for the American Stove Company and commissioned Noguchi to design the curvy, organic ceiling for the lobby. In the 1990s, the ceiling was covered up by U-Haul with a drop-ceiling and further obscured by partitions. According to The New York Times, experts in the decades since have considered removing the sculpture and transferring it to the Noguchi Museum in Queens, but were concerned the move would destroy it. In addition to removing the drop ceiling, the renovation included repairing the can lighting and repainting the walls to their original colors.